You know that movie you really, really like that everybody else hates? We all have one. For me, that movie is Dirty Work. I've always liked Norm MacDonald, so when I learnt Norm was filming a Bob Saget film right in my own backyard, I was pretty psyched. There are scenes filmed all over Toronto, from U of T to the office at Jane and Annette. There's also a fantastic Chris Farley cameo on Annette. I'm thinking about the hilarious Dirty Work today because Artie Lange is in the hospital recovering from a suicide attempt. I first got to know Artie Lange from Dirty Work, but then got to truly appreciate his talent as co-host of The Howard Stern Show. Artie was always brutally honest about his demons, demons that would lead him to stab himself nine times this past week. According to this morning's Stern show, he's alive and physically out of danger now. Here's hoping he pulls through and find some good in life. 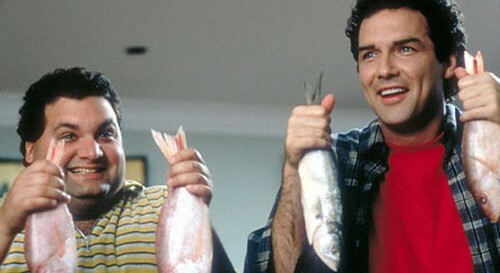 If you want to see Artie Lange and his buddy Norm MacDonald at the height of their powers, watch Dirty Work. I love it and I don't care who knows it. I friggin' love that fish scene. Don Rickles' adlibbed performance as the theatre manager is top notch. "Look at you, you baby gorilla" - you can't make that sort of stuff up. In the early 90's Norm and some of his comedy buddy would have a beer or two at the Red Lion a pub that was located across the street from the old CBC building on Jarvis street. Too bad about artie. It's true what they say about comedians being the saddest guys out there. Never heard of this movie before but got to see it now. Didn't know about Artie either, all the gambling debts maybe catching up to him. Comedians have to be insane and edgy or know one will pay attention.